Airbnb Removes Accounts Ahead of Far-Right Rally in Va. 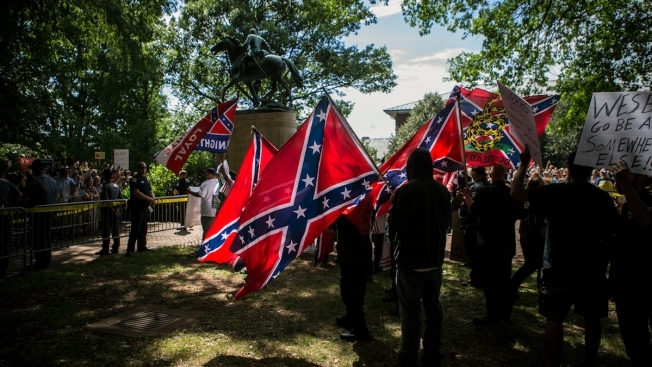 In this file photo Ku Klux Klan protests the planned removal of a statue of General Robert E. Lee on July 8, 2017, in Charlottesville, Virginia. Airbnb deleted accounts of people who planned lodging ahead of a similar, upcoming rally on Satuday, Aug. 12, 2017, that aims "to affirm the right of Southerners and white people to organize for their interests." Airbnb has deleted accounts and canceled bookings of users who appear to be connected to "Unite the Right," a far-right political rally set for Saturday in Charlottesville, Virginia. Neo-Nazi and white supremacist website The Daily Stormer had organized a series of large rally-weekend gatherings through the home-sharing site, Airbnb told NBC News. Concerned Airbnb users flagged the thread, leading the company to investigate potential violations of its user contract, which calls for unbiased hospitality. Airbnb said they decided to remove the far-right lodgers because they were "pursuing behavior on the platform that would be antithetical to the Airbnb Community Commitment." Jason Kessler, organizer of the "Unite the Right" rally and self-described "pro-white" activist, said Airbnb's blocking of certain users is "outrageous and should be grounds for a lawsuit." Clay Hansen, the executive director of the nonpartisan Thomas Jefferson Center for the Protection of Free Expression in Charlottesville, said Airbnb's choice to terminate accounts does not violate the First Amendment. "I would say that while Airbnb's actions wouldn't necessarily comport with general free speech principles, they are a private company and are entitled to enact and enforce their terms of service as they see fit," Hansen told NBC News. The rally, scheduled to take place Saturday in Charlottesville, is shaping up to be the "the largest hate-gathering of its kind in decades," according to the Southern Poverty Law Center. As of Tuesday, Aug. 8, almost 700 people said they would be attending, and another 1,200 showed interest in the event on its Facebook link. The rally aims to "to affirm the right of Southerners and white people to organize for their interests." "It's the racial targeting of white people for their ethnic advocacy," Kessler wrote in an email to NBC. "Would Airbnb cancel the service of black nationalists or Black Lives Matter activists for their social media activity? Of course not!" White supremacists gathered in Charlottesville in May to protest the removal of Confederate Gen. Robert E. Lee's statue. They chanted "All White Lives Matter" while carrying torches. Klu Klux Klan members also protested there in July for the same cause. The statue has not yet been taken down, but Charlottesville has gained the reputation for hosting white nationalism rallies.